Win a $100 gift certificate to Hard Rock Cafe! Congratulations to Bernadette DiCaro on winning our sixty second High Five Giveaway and thank you to all who entered! 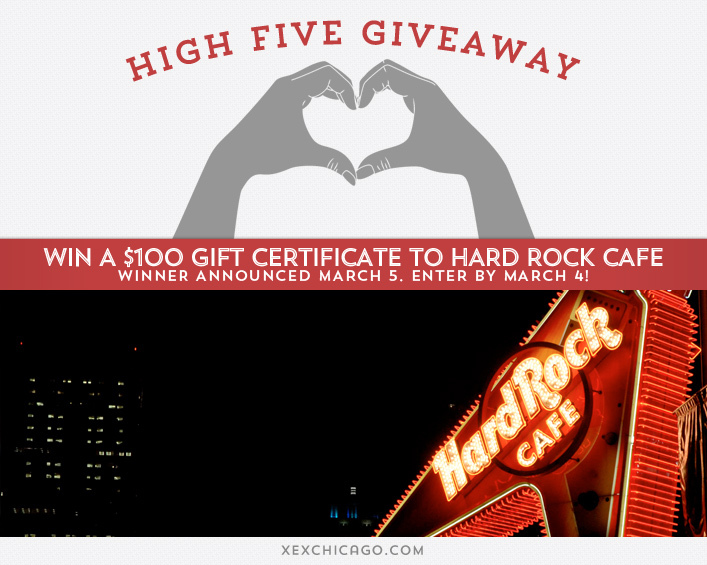 Our next High Five Giveaway is for a $100 gift certificate to Hard Rock Cafe. Hard Rock Cafe Chicago has celebrated 25 years at the corner of Clark and Ontario, in the heart of Chicago’s River North neighborhood. Located just 5 blocks west of Michigan Avenue, Hard Rock continues to “Love All Serve All” 364 days of the year. Lauded for diversity in all areas and embracing classic and funky trends with equal ardor, Hard Rock Cafe has something special for all. Whether you need a Hickory-Smoked Pulled-Pork sandwich after shopping on the Magnificent Mile or a Rockarita after the theater, you’ll find a wide variety of Legendary Cuisine. Visit their website at www.hardrock.com/chicago or call them at 312-943-2252 for more information. What is one reason why your hair might stop growing? Now, just add a comment to this post with the right answer to be eligible to win! The winner will be announced on Wednesday, March 5. Entries must be received by midnight on Tuesday, March 4. Good luck!